Unashamedly the most biased sports book ever published in New Zealand! 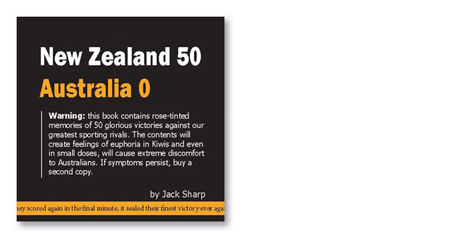 Jack Sharp reminds us of the fifty biggest shellackings ever served to Australia by New Zealand’s greatest sports teams. Sports include rugby, league, football, netball, cricket, basketball, yachting, horse racing,hockey and a few surprises. Neatly packaged as a hardback book, this is the perfect gift for your favourite Aussie. Jack Sharp loves his sport and serving it up to Australians.